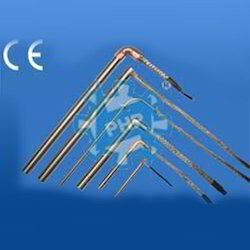 The Low Watt Density Cartridge Heaters and High Watt Density Cartridge Heaters offered by us are fabricated using high grade NiCr 80:20, are evenly wound over a supporting core. These supporting cores are located in a SS321 tube. Further, our heaters are appreciated for their features such as superior life expectancy, bottom end welded with disc washer and high operating temperature. These are widely used for hot runner bushings, packaging industry, shoe making industry, marking & sealing machinery, Die and patents, medical & laboratory apparatus. Available in standard sizes, we also customize these as per the requirements of our clients. 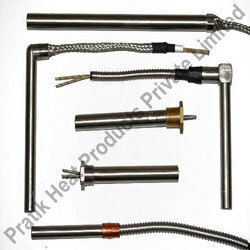 Pratik heat products CE certified cartridge heaters are manufactured with premium materials and tight manufacturing controls. With 40 years of practical experience, PHP cartridge heaters ensures highest quality standards to provide superior performance and life expectancy at higher temperatures for many diversed applications. Heating conductor grade nicr of higher grade is evenly wound over a supporting core which is centrally located in a chrome nickel steel tube and the inner space is filled with specially selected high purity magnesium oxide. This assembled unit is then highly compressed, converting the core, powder and conductor into a homogenous mass. The bottom end of the heater is welded with a conical disc washer to prevent contamination and ease of replacement. Robust terminal with choice of exits. Sealed bottom with conical end disk to prevent contamination and for easy replacements. Various watt density option available. Available with various lead exits & cable protection option. Chrome Nickel Steel, welded end disc washer of same material. Looking for Cartridge Electric Heaters ?